REMEMBER... Dr. Seuss, The Wild Things and Ramona? How many Dr. Seuss books can you remember? What was your favorite? During our “Seuss Celebration” we read all eighty-six. Imagine that opportunity! Imagine a library at your fingertips every day! Our love of books and the importance of literacy experiences for the children is demonstrated by our school library. With over one hundred books available daily (and several hundred more to be rotated on a monthly basis), our library gives children many opportunities to “read” and hear quality literature throughout the day, not just a “group time”. We use our themes to help guide our rotation of books. However, favorites can be requested at any time! We visit the neighborhood book store where we purchase new books regularly. 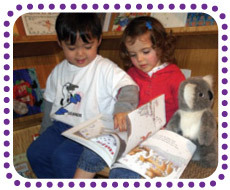 Children often curl up with a friend or lounge by the fireplace with a good book. REMEMBER... Gallons of glue, endless paper and crayons? At our Writing Center these and other art materials are always available for the children to use and explore to their hearts' content. When children are given opportunities to problem solve “which lasts longer and holds better, glue or tape?” or “what do you need to support the back of a paper mask?” they become creators, inventors and problem solvers. By having the opportunity to use these materials the child is developing the skills needed for writing as well as learning to express themselves in a creative way. The small muscle development and eye hand coordination necessary for holding pencils is strengthened by cutting, squeezing glue and gripping crayons. At ABC we use clay because clay has all the tactile aspects of playdough plus lots of extras. Clay, like most everything else in our learning environment, is always available. Children delight in getting out the clay and a clayboard when an idea hits them. We often hear them say “hey, let's go make that out of clay!” and they dash off. Children who spend lots of time with clay understand it; they learn how to mold, shape and build so the clay will reflect their visualization. If a child decides he is happy with his creation, he can save it, send it to the kiln, paint it and mount it. A process that can take some time. This process requires patience as well as creativity. Although the masterpieces the children make are just that; the process is what is important. REMEMBER... Planting beans in milk cartons? We are fortunate to garden year round at ABC. We have an indoor gardening system that allows us to start from seed plants that we will watch, tend and enjoy. In early spring we will nurture these seedlings that will flourish in our outdoor garden. Preparing the soil, planting the seeds, watering and weeding are jobs the children enjoy as they wait for the flowers and vegetables to grow. Their patience pays off as they dig potatoes, pull carrots, and enjoy finding a “finally red” tomato. Every fall we celebrate our harvest together and make salsa. The children are always excited to pick the ingredients, prepare the salsa and share it with their friends and families. REMEMBER... Block towers, empty boxes and train tracks? Imagine a room with enough blocks and trains for children to build to their heart's content. We feel strongly that limiting block and train play to a table or a corner robs the children of the chance and challenge of designing their own structures and layouts. Our block room has a wide variety of mathematically accurate blocks available. Through hands-on experience with unit blocks, children learn math and spatial concepts and develop social skills. Block play enhances physical development, expands language and fosters creativity. Block play stimulates dramatic play as blocks represent castles, cities and fire engines. Cooperation and verbalization are necessary skills for this area, as well as life.